One cannot mention From Software without mentioning its hugely influential and infamously uncompromising action titles, Dark Souls and Bloodborne. Loved and feared in equal measure, but almost universally respected, the games have become fierce fan favourites and established a very specific set of expectations from its creators. For its next big release, Sekiro: Shadows Die Twice, the team have made some bold changes to their celebrated formula, reimagining and completely overhauling many of their iconic design staples to create something ambitiously different. 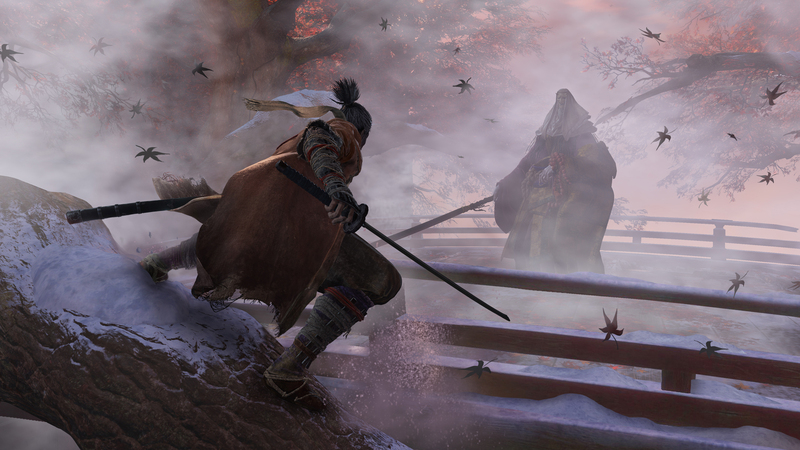 With Sekiro launching today, we thought we’d take a moment to give you a few handy day-one tips and explain what veteran From Software fans will need to keep in mind as they take on this challenging new adventure. The dim glow of an unkindled bonfire is the true siren song of a seasoned Souls fan – a place to take a rest, refill your supplies and set out with fresh determination. In Sekiro: Shadows Die Twice, it’ll be the faint blue glow of a Sculptor’s Idol that will offer sanctuary from the harsh environment. From here you’ll be able to re-fill your inventory, stock up on healing items, unlock new skills and fast travel to other points you’ve discovered. The more you progress through the game, the more useful these will become, adding new options and abilities as you go. Unrestricted by stamina limitations, you’ll be able to run, vault and dart about the world, hanging from ledges, swinging from your grappling hook and bearing down on enemies from on-high. This new-found freedom aids not only exploration but plays a key role in combat: if the toe to toe approach isn’t working for you, try running, jumping and swinging to outwit your enemies. While it’d be lovely to have a Buddha Statue plopped by the roadside every hundred yards or so, Dark Souls fans will know better than to expect such a reliable sense of safety from the designers at FromSoftware. While games like Bloodborne and Dark Souls offer the occasional opportunity to backstab an opponent, for the most, classic FromSoft titles have you facing your enemies head-on. As an agile shinobi, however, you’ll be expected to strike your enemies from the shadows: stalking the tall grass, leaping from behind a wall or dropping from secluded rooftop. Out-numbered as you’ll often be, this will be your safest option. Groups of enemies can deal large amounts of damage and close around you quickly, so survey the area, distract and separate your foes, and pick them off in ones and twos – otherwise death might be surprisingly swift. No Dark Souls adventure would be complete without bumping into a handful of lonely wanders, travelling merchants or other eccentric, itinerant sorts. In Sekiro: Shadows Die Twice this tradition is alive and well. Take the time to speak with any friendly NPCs you run across, as many will have useful information, items for sale or other helpful tid-bits to offer. Not only this, the new ‘eavesdropping’ feature also adds a fresh dimension: listening in on the conversations of your enemies will yield not only useful story information, but occasionally clues on how to tackle certain enemies, where to find specific items or where to go next. While Sekiro’s shinobi protagonist has only his trusty sword ‘Kusabimaru’, he has a vast amount of flexibility with it. Dodging and blocking remain, but the true goal is to overpower your opponent through timing and finesse. Brute force is reckless: many combatants will use misplaced attacks to open you up for counter blows. Read their movements carefully: deflect their attacks and time your ripostes to break their posture, opening them up for deadly ‘deathblows’. Some of these moves will take practice to master – if you need to hone your skills, seek out ‘Hanbei the Infested’ at the Dilapidated Temple, who’ll be willing to spar and train with you. That simple but elegant staple of Dark Souls gameplay, the Estus Flask, finds its spiritual successor aiding our hero’s travels in Sekiro. Filled with a mysterious medicinal water, this humble alembic will re-fill itself when you rest at Sculptor’s Idols and its uses can be expanded if you track down Gourd Seeds and hand them over to Emma at the Dilapidated Temple. Instead of levelling statistics, as you move through the game, you’ll have the chance to unlock a range of passive and active skills from a number of distinct skill trees. While some will increase power, most will augment existing abilities or offer new ways to approach each encounter. Combat Arts unlocked via these trees can only be equipped one at time, so ensure you spend your points on abilities that’ll best compliment your play style. Rarely in a Souls game will you find yourself railroaded along a single narrow path, with no option but to press on or give up. Sekiro carries forward this philosophy, offering multiple directions in which to explore from the initial hub, each with different environments and unique challenges to overcome. Using the Sculptor’s Idols, you’ll be able to navigate between these as quickly as needed. If you find yourself up-against a challenging obstacle, try exploring elsewhere and developing your abilities before coming back for a second try. Off­-hand weapons are nothing new in the Dark Souls universe, but Sekiro’s shinobi prothesis is so advanced and flexible, it far outstrips what we’ve come to expect. Starting off as little more than a replacement limb, as you explore, you’ll be able to enhance its function with new gadgets, from heavy melee weapons to explosive crowd-control measures and precise ranged projectiles. Take heed: this mysterious contraption has but limited uses, so be prudent. New attachments turn up all over, dropped by enemies, hidden in shrines or for sale with certain merchants. Keep your eyes open and when you find a new one, return to the Sculptor at the Dilapidated Temple to install the upgrade. Some enemies require certain prosthetic fittings to overcome, so if you’re struggling with just the sword, consider what prosthetic attachments you have available. The FromSoftware team have long sought to reward those attentive players that comb over each area with care, placing carefully hidden items and pathways just out of sight for canny explorers to find. 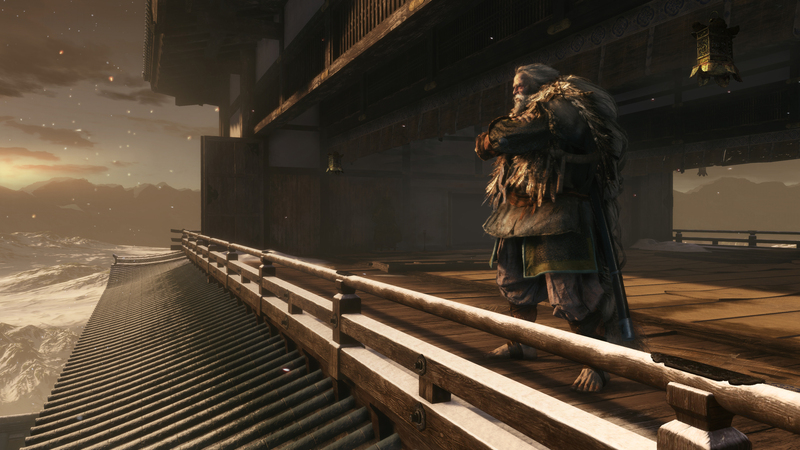 Sekiro holds to the same philosophy, but hides more than just items and entrance-ways: careful investigation of each area will reveal multiple different avenues to approach your enemies – skirting along a building side, shimmying up a cliff or creeping beneath a building. Don’t rush through areas, there’s much to be missed by those not paying attention and many game-changing rewards to be discovered, including items, NPCs and entirely new areas. Hands off that sprint button, Souls-fans, there’s no need to go gambolling back to the last place you fell to retrieve your lost plunder. While death is a very significant part of Sekiro, it’s not as closely tied to levelling as in previous FromSoftware titles. In order to gain new skills you’ll have to earn Skill Points, accumulated by overcoming ordinary foes. Growth in areas like vitality and strength, meanwhile, will require special items – prayer beads and memories – only dropped by far more powerful adversaries. Trade all these at the Buddha Sculptures to develop your skills and improve your efficacy in battle. The Hollow, the Unkindled and those burdened with dreadful Insight amongst you will know well to what we refer to here. While we’re in no hurry to spoil anything in Sekiro: Shadow Die Twice, rest assured that over-arching systems that tie closely with both your progress as a player and the world’s ongoing narrative are deeply woven into the experience. Meeting a true death will reveal a new system which will affect not just you and your ability to recover from future failures, but also the wellbeing of those around you – moreover, these will stack the more you fail. Fear not, however: it is possible to reveer if you’re struggling, speak with Emma at the Dilapidated Temple for more information. The Dark Souls series has made a virtue – an emboldening rite of passage – of in-game death and so it seems apt that this new outing should seek to turn this on its head. As the game’s subtitle suggests, those laid low by their adversaries can draw on a remarkable gift to rise from the grave and fight once more anew. Moreover, those who make good on this blessing and endure against all odds, might find further blessings await. And with that, we’ll say no more. Like all FromSoftware games, a core part of the experience is exploring the game world and discovering things for yourself. We hope this will have given an idea of what to expect and how to avoid some of the early pitfalls. Sekiro: Shadows Die Twice is out now on PlayStation 4 – buy it now on PlayStation Store. 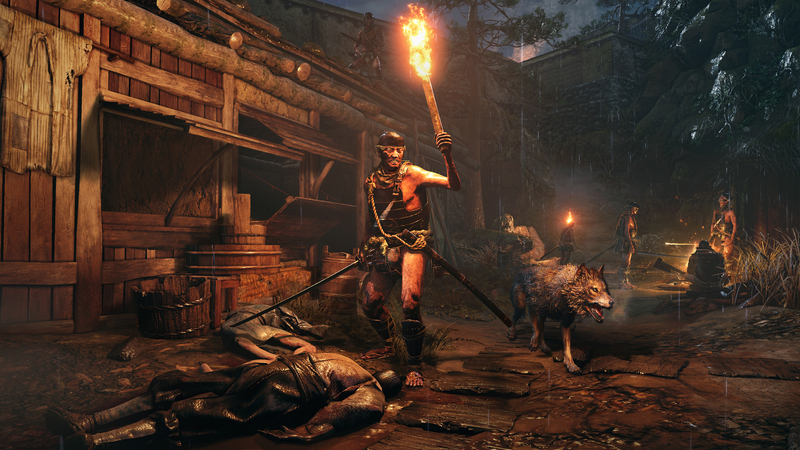 The post 14 day-one Sekiro: Shadows Die Twice tips for Dark Souls/Bloodborne veterans appeared first on PlayStation.Blog.Europe.